Beginning with the forms of this specific genre, we have seen bio-pics that revisit the proud history, honouring a great historical figure (or an event) enlightening the new generations fulfilling a social responsibility. And then we have seen bio-pics made to inspire as well as entertain rediscovering a creative personality/achiever from the world of arts or sports having an interesting life-story to share. On the other hand, we recently got to see many propaganda films in the genre, forcefully commenting/suggesting upon a murder case against the court verdict, films glorifying a don, justifying his criminal and unlawful deeds creating a social-hero, films made to clean or whitewash the image of a star or a project specially made to demean the other political party in the name of an adaptation of a book. However the present bio-pic THACKERAY surpasses above all as it neither justifies any of the icon’s questionable acts nor is interested in any logical explanation for the controversies involved in the life of Bal Thackeray, the founder of Shiv-Sena, popularly known as Bala Saheb in the state of Maharashtra. The film is written and produced by Sanjay Raut, a prominent member of Shiv Sena and is purely an unapologetic and revealing bio-pic that has not been made to entertain, but daringly inform the viewers, particularly the younger generation (the millennials) as a purposeful film releasing at a perfect timing. To be exact, the film never presents Thackeray as any misunderstood hero and never hides what he did to achieve the huge stature. It’s a straight at your face film which accepts all the violent acts, hate-speeches and divisive acts initiated to save the “Marathi Manoos” and is simply not interested in any kind of excuses at all. But at the same time, this also happens to be a well-made and enacted film showcasing the craft that cannot be ignored and needs to be given its deserving praises. 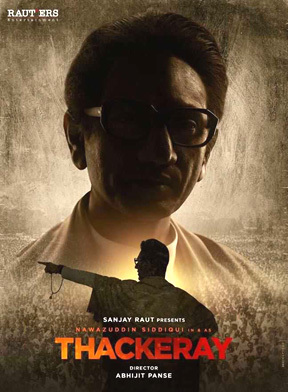 as a film THACKERAY majorly works because of its so believable, controlled and fiery performance from Nawazuddin Siddiqui, who truly lives the character on screen slipping into the skin of Bala Saheb Thackeray. Nawaz delivers a highly gripping performance and carries the film on his shoulders throughout. And this is really outstanding as the gifted actor constantly keeps surpassing his own past performances with such a blessed ease. Here, what essentially needs to be mentioned is the carefully chosen voice for the character, which remains the same as Nawaz’s own and he wisely doesn’t go for any forced modulation like recently seen as a misfire in THE ACCIDENTAL PRIME MINISTER. Besides, Amrita Rao playing Meenatai (Thackeray’s wife), also puts her heart into the act, winning over the viewers in her few scenes coming at intervals. Plus the lookalikes mostly turn out to be good playing the known characters like Indira Gandhi, Dilip Vengsarkar, Javed Miandad, Dada Kondke and more. Secondly, THACKERAY works in its technique incorporated to tell the story beginning from a court room scene going back to the time period of 60s to 90s skillfully recreating the era within the given resources. The majority of the first half retelling the story of his rise from being a cartoonist to the influential leader of a new political party in Maharashtra is smartly presented in Black and White, which again returns to Colour as the film comes back to the well written courtroom scenes. Skillfully shot by Sudeep Chatterjee, the narration in the first half also includes a long yet impressive cartoon film depicting the trauma faced by Marathi residents in Mumbai overpowered by the migrants from other cities. The decision of going monochrome and expressing the proceedings through cartoons work well and so does the CGI recreation of the era using actual names of all known political and social figures. In addition, it’s interesting to see the adaptations of a few known and lesser publicized events of the past including the meeting between Thackeray and Indira Gandhi during the Emergency, his meeting with both Dilip Vengsarkar and Mian Dad discussing the Cricket matches between the two countries, Shiv Sainiks destroying the prepared pitch in the stadium, the confrontation days with Morarji Desai, his support to all Marathi films acting on a complaint made by Dada Kondke and more. But above all, I personally found it extremely interesting to compare it with Ram Gopal Varma’s interpretation of the icon and his home-darbar in SARKAR, adding the obvious references of the cult GODFATHER. Particularly its fascinating to see the way he meets with the local people in trouble, greets the followers who worship him like a demi-god and the manner he treats the guests including the ones coming from Pakistan. Despite being a well-made film, what actually hampers the narration? As a film THACKERAY gets severely affected by its at your face propaganda and a one-sided biased representation of the facts/event. Interestingly, it reveals everything without any hiding but also without giving any kind of mileage or importance to the other side. The more than two hour film has clear references of brutal violence, murders, Babri Masjid demolition, Mumbai riots and conflicts with the then governments too shared with honesty. And just like the real Thackeray didn’t have any fear to say it openly, the film also does the same and even has sequences with strong divisive dialogues and controversial speeches given forgetting all about the law. To be fair, this is one of a kind of film, which doesn’t present its icon as any saintly social personality but still portrays him as the man of the masses spreading his message as it is, supporting a particular sect. And that’s exactly what hampers the film, presenting hate speeches and policy of division as a new kind of revolution. Why the film has been made and with what purpose! As I see it, THACKERAY - the film, was never made to entertain the viewers or to make any kind of major impact at the box office. It was purposefully made to inform the viewers about Bal Thackeray, his story and his influential hold over the system, particularly targeting the younger generation and the people outside Mumbai or Maharashtra. Putting it differently this is an intentional attempt to widen the reach as well as the impact of Bal Thackeray and his Shiv-Sena (out of their owned region) using the medium of cinema, which is one of the most influential and followed means of communication within the country. Frequently conveyed by a tiger’s roar in the background, this is an unapologetic tribute to the man by his own men with a motive to go beyond their specific ruled regions. Why you should essentially see it? The makers wish you to see the film and I too wish the same as many of the millennials (born in the 90s or later) just have a vague idea about Shiv-Sena and Bala Saheb Thackeray, but don’t have the exact information about his background, his rise, his basic vision, his methodology and how he become a huge figure in the political scenario of Maharashtra. The film doesn’t hide anything talking about his bold journey (seen from his individual perspective) and thus everyone should essentially see it, in order to form his or her own personal opinion of the cult personality, as per their individual learning, thought process and understanding of The RIGHT and The WRONG. no doubt THACKERAY is a technically well-directed film with a towering lead performance as well as a purposeful propaganda project releasing on a perfect timing (before the upcoming elections). But if this is fine with all (both with the people and the authorities) then there can be many more bio-pics made on the influential icons of every state promoting their specific regional language and people, pulling us back to the square one. For instance, a much more powerful film can also be conceived on the famous leader of Punjab known as BHINDRAWALE. But that's another thing that no one will dare to make it as the Sikh leadership itself remains divided and has never been together promoting its strong and popular regional language and culture. Anyway, do watch THACKERAY to form your own opinion about the man, his strategies and his mission, since there is also going to be a sequel as conveyed by the film in its final credits. And what you will conclude about the cult figure...... will hold the key for what will be coming ahead in the near future!